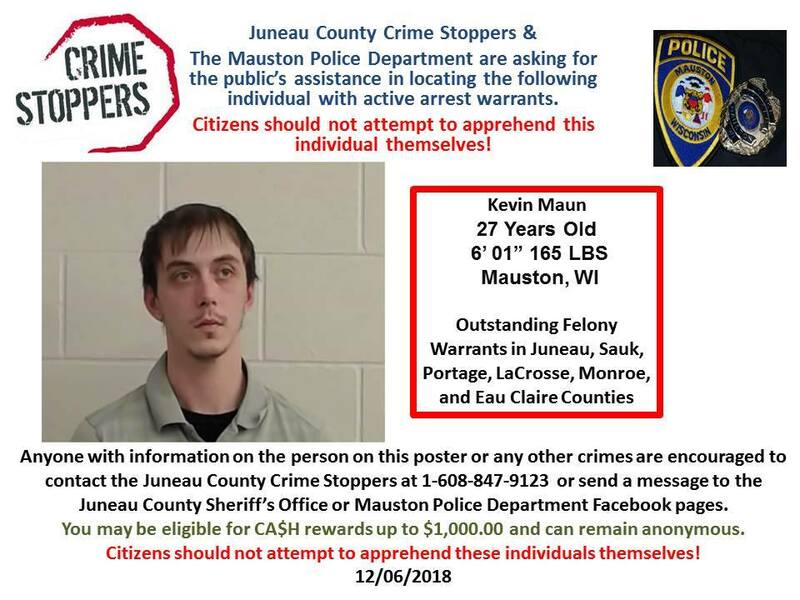 The Juneau County Crime Stoppers and the Mauston Police Department are asking for help in locating 27 year old Kevin Maun of Mauston. Maun has outstanding arrest warrants in Juneau, Monroe, Sauk, La Crosse and Eau Claire Counties. Maun is a 6’1 165 pound white male. Citizens should not try to apprehend Maun themselves. Anyone with information can contact the Juneau County Crime Stoppers at 1-608-847-1923 or send messages to the Juneau County Sheriffs’ or Mauston Police Departments Office Facebook pages. You may be eligible for cash rewards and callers can remain anonymous. This entry was posted by WRJC WebMaster on December 6, 2018 at 1:57 pm, and is filled under Local News. Follow any responses to this post through RSS 2.0. Responses are currently closed, but you can trackback from your own site.